Keeping fit depends on the amount of activity one does. Certainly, exercises are the easiest way out. Still people find it unsuitable mostly because they don’t have enough time or they get bored. Cycling can do wonders in this regard. No matter if one is adept at it or not, learning it offers a lot of excitement and also health benefits. In this regard, an MTB or mountain bike can be of immense help since it not only has the added strength, but also has the required features for conquering most rough terrain with ease. This Diamondback Bicycles Recoil Trail Full Suspension Mountain Bike Review is about one such MTB that has covered an immense range of features within a tight budget. The suspension fork in the Diamondback Recoil Complete Bike is one of the edges this two-wheeler has over most other MTBs. The front suspension in enhanced by the “Suntour SR” fork with “120mm travel”. Also, the preloaded settings help in fine tuning the bike’s suspension according to one’s riding needs. These fine adjustments make a huge difference in experiencing a bike ride. Comfort matters when it comes to rough terrain or even day to day commute. The right suspension technology with the right adjustments can provide the needed ride-comfort near perfection. The Diamondback Bicycles Recoil Complete Full Suspension Mountain Bike may come at a tight budget, but it did not compromise one bit when it comes to user safety. Disc brakes are not only safe but they offer more protection. The Recoil Trail puts into action,“Tektro Aries” mechanical disc brakes which offer unmatched braking ability. While most budget friendly MTBs recline towards normal padded brakes, or cheaper disc brakes, this bike offers disc brakes on both rear and front wheels. This offers greater control while rough terrain rides where out of control speeds can cause danger. MTBs tend to be heavier than other types. While this is true, still MTBs can be lighter too. In the Diamondback’s Recoil Trail, this stands true. The aluminum body frame of the recoil trail is responsible for most of the cut offs in weight department. The strong aluminum body frame allows for greater strength and its ability to be used in rugged terrains. With about 4 inches of travel on a single pivot design, this body frame allows for unmatched comfort while riding. The “Recoil Complete Full Suspension Mountain Bike” has been enhanced with 24 speed control gears. This is the result of 8 cog cassettes and triple chain ring crank from Suntour. The benefits are noticed by people often riding on mountain trails. The 24 speeds offer bikers enough choice to choose from while controlling their ride on rough terrains. This many speed options can come handy on situations like downhill rides on rough terrains where one has to keep balance while pedaling and still maintain a speed limit. The Recoil Complete Bike being mentioned here in this review has 27.5 inch wheels. Though other sizes are available for more bikes but the 27.5 inch standard is voted to be the best when it comes to the balance between speed, control and all terrain challenge. This size is the easiest one to control rather than 29 inches size which can prove to be daunting in mountain trails. The lighter and sleek wheels can easily accelerate and also lighter. Front suspension offers adjustable settings and has a 120mm travel. Aluminum body frame reduces overall weight and is durable. Mechanical disc brakes is available on both front and rear wheels. Comes with 24 speed control gears. 27.5 inch wheels offer the best in class performance. Stock part like the pedal supplied is made of plastic which can cause grip failure on rugged terrains but can be upgraded to metal pedals. Q) What Sizes are available for the bike? A) This is offered in 3 Sizes: 16 inch, 18 inch and 20 inches. Q) Does it offer straight or tapered front suspension fork? A) It offers straight front suspension fork. Q) How to upgrade the bike parts and which parts are upgradable? A) Most bike parts such as brakes, suspensions, pedals, etc are upgradable. When it comes to choosing mountain bikes one has to pay attention to a lot of thing other than style and comfort. 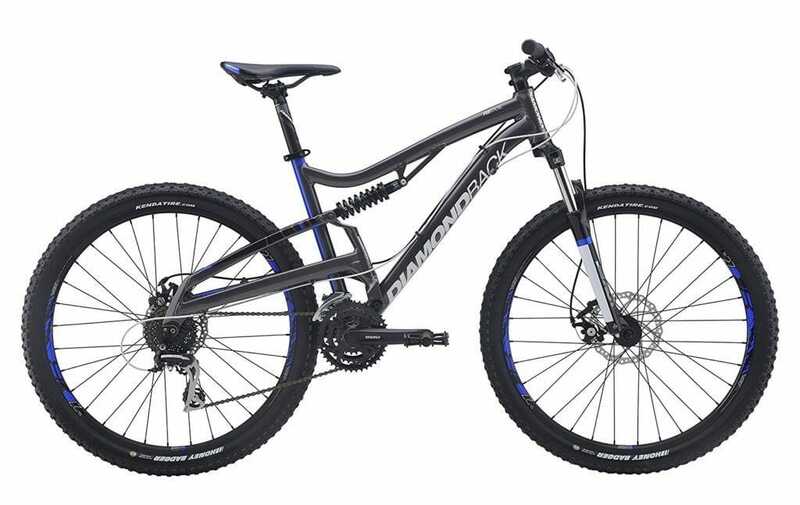 In this Diamondback Recoil Complete Full Suspension Mountain Bike Review one can easily see that this bike has almost all the main areas covered. Not to mention but according to user reviews, this bike can easily be compared with bikes costing above a thousand bucks. While a budget contender, this bike sports the entire necessary features one may need. The best thing about this model is, it can be tweaked and enhanced according to ones like and needs. If one is searching for an all-rounder MTB, this is certainly a ride worthy of mention.